I get this error message when I try to import into MySQL. I am using the latest version of SQLBackUpAndFtp. It used to work with previous versions, but not any longer. I have a preliminary solution for this: I edited the generated .sql file and deleted all DELAYED statements from it. Then it worked. Obviously the DELAYED statement is not only deprecated it seems to be completely useless, too. Can you guys fix this bug please. Please give us some time to check and fix this issue. Thank you for your logs, we have checked them. Delayed Insert instruction was added to mysqldump in some older MySQL Server versions. We haven’t added this instruction as it isn’t added in the latest versions of MySQL Server. I do not understand your reply to be honest! Does this mean you will not fix this bug?? How am I supposed to fix it myself? 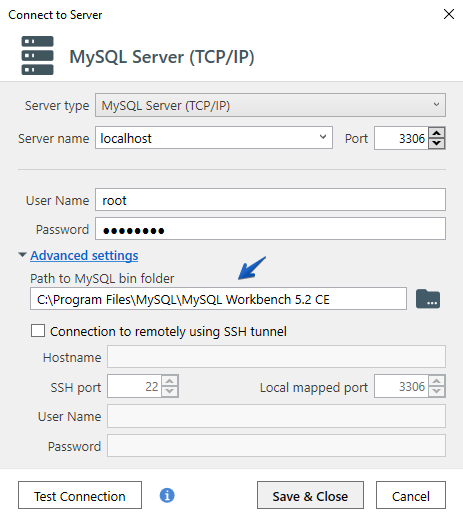 If I use MySQLWorkbench and do the export of the data from the server with it I have no issue to load the database locally. Using your tool it does not work for the reason mentioned above. Hence: There must be something MySQLWorkbench is doing right with the export and something that your tool does wrong. Just checked the .sql file that MySQLWorkbench generates: It contains normal INSERT statements without the DELAYED option! 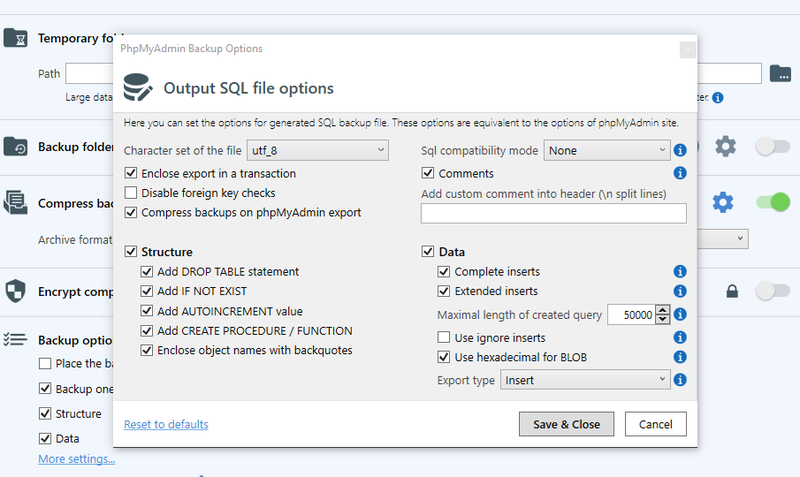 SQLBackupAndFTP does not specify the –delayed-insert instruction at all, it should be specified by mysqldump utility. Perhaps in some versions of mysqldump, –delayed-insert instruction is enabled by default. Could you please specify what version of MySQL Server do you use? Also if you specify a path to your bin folder at the advanced connection settings, please tell us what version of mysqldump do you use? Hi, I use phpMyAdmin to connect to the remote server and I don’t specify “Path to MySQL bin folder”. Thanks for the details. We thought you use MySQL Server (TCP/IP) connection. Please give us some time to check this issue for phpMyAdmin. We have checked this issue with different versions of phpMyAdmin (including 4.8.4) and weren’t able to reproduce the issue. 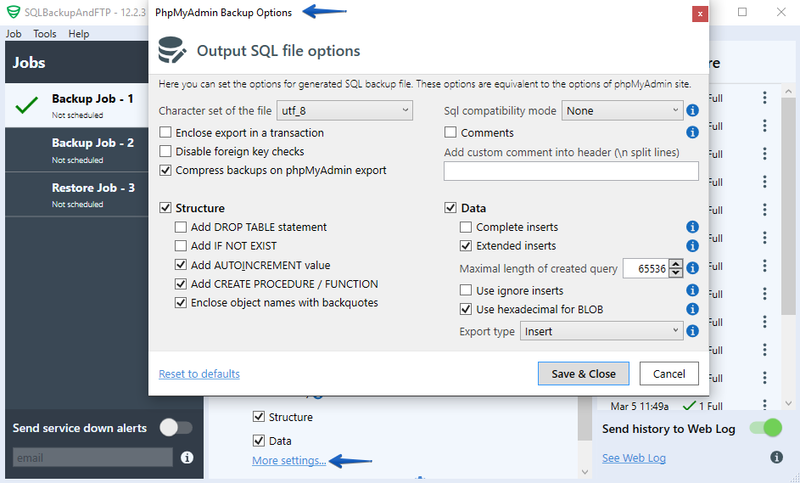 Could you please send us a screenshot of your “phpMyAdmin backup options” window? Thanks for the details, but your screenshot isn’t displayed. Could you please try to download it again? Please use Chrome. Then you can see it. With Firefox it is actually not displayed. Can’t log into my account in Firefox because I haven’t memorized my credentials. If I upload it in Chrome again it probably won’t be visible for you in Firefox either. And Chrome is a lot faster than Firefox too. We use Chrome and still cannot see the screenshot. If it possible, please download your screenshot again. Thank you for your reply. Please feel free to contact us on any issues or concerns.